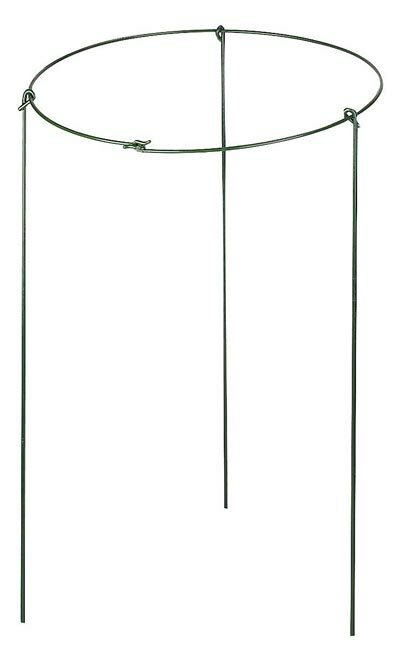 Help your daylilies and other long stemmed flowers grow well with the Gardman Plant Support Ring. Adding a ring around your medium to large shrub or flower directs the stems to grow upward, to ensure a healthy root system. The 15.25" diameter, top ring on this support is great for controlling spreading shrubs or flowers, and a latch on it allows you to open and close the ring as needed for repositioning or maintenance. The three, 23.75" long legs keep the item stable in soil, and the green hue blends with your plant. Its plastic coated, steel body remains durable for many seasons. Have a thriving garden or landscape with this Plant Support Ring. Note: This case pack includes 20 of the Gardman Plant Support Rings, 15" dia. x 24"H.